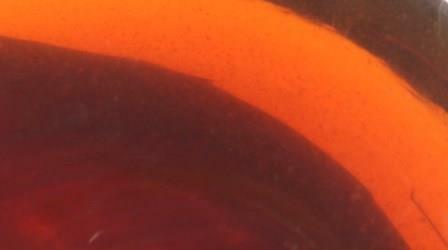 Casting Tea is the liquid form created from brewing the worm casting material. Like worm cast, it makes an excellent all-natural, water-soluble plant food, soil amendment and insect repellent. It's an excellent nutrient-rich, toxin free, organic soil amendment that replenishes the biological diversity of your soil. The microbiology is extracted with water so that it can be applied as a foliar (sprayed) which is typically an easier application method for established plants. Please note that the microbiology of "casting tea" will be different from that of "compost tea". Typically, both teas are brewed, but casting tea has more species diversification and worm created substances offering more effective results. Leaché on the other hand, is not brewed and is what has drained to the bottom of worm bins and compost units; also very good for your soil! 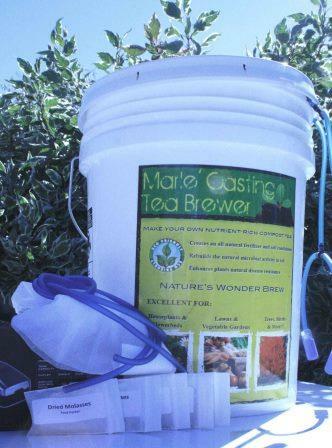 Worm casting tea interacts with the soil microbes and protozoa, soil particles and roots of the plants themselves creating a healthier environment for plants due to the symbiotic relationship between the plant and the microbes in the root zone. The microbes will turn organic matter into humus, storing energy for when it's needed (a basic unit of soil fertility). Our bucket uses a pump/stone combination to aerate the water, extracting the microbiology. It's takes very little assembly and comes with 5lbs of SoilBoost (screened worm cast) which is enough to brew 25 gallons of cast tea. 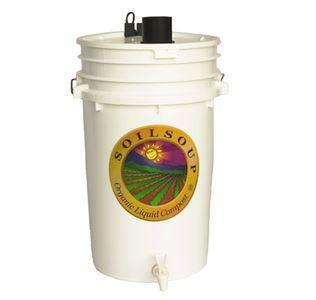 A perfect size for home use - 5-gallon bucket. There are two sizes to choose from: 7-gallon and 25-gallon. 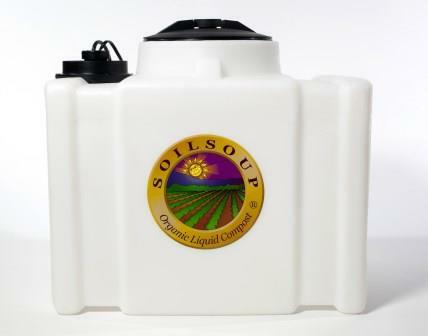 Both brewing systems make liquid compost and come complete, ready to start brewing. They are self-contained units that produce fine air bubbles to extract the microbiology and include enough additive to brew 128-gallons of liquid compost. Or we'll brew it for you ... Liquid SoilBoost! Whatcom County's WSU Cooperative Extension conducted on-farm research that allowed growers to evaluate tea as an Integrated Pest Management practice, the article is entitled, Brewing up Solutions to Pest Problems. They have an additional brief article, To Tea or Not to Tea. Casting tea, like its counterpart worm cast, will accelerate the breakdown of plant material when added to a compost pile, reducing the amount of time to make a finished product. Casting tea is completely safe to all plants, animals, humans and the environment in any concentration. Plants absorb it easily and immediately and it will not burn.